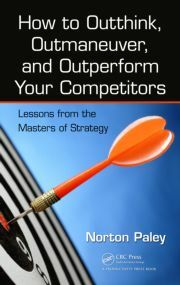 How to Outthink, Outmaneuver, and Outperform Your Competitors: Lessons from the Masters of Strategy explains how to develop the skills and strategies needed to compete in today’s volatile marketplace. BOCA RATON, Fla. - April 26, 2013 - PRLog -- Supplying you with a firm grasp of the roots of strategy, How to Outthink, Outmaneuver, and Outperform Your Competitors: Lessons from the Masters of Strategy explains how to develop the skills and strategies needed to compete in today’s volatile marketplace. It interweaves the classic works of the masters of strategy, such as Sun Tzu, Carl von Clausewitz, Mao Tse-tung, Niccolo Machiavelli, Frederick the Great, Napoleon, and other renowned strategists. The collective insights of these legendary strategists span 2,500 of combative history and have survived meticulous analysis by scholars. Applied to current competitive business conditions, their time-tested rules and guidelines will prepare you to deal with such issues as: preventing competitors from disrupting your overall growth plans, protecting yourself from a rival’s take-over strategies, and strengthening long-term customer relationships. Strategy Diagnostic Tool—A structured system to help you assess your firm’s competitiveness before committing valuable resources. Appraising Internal and External Conditions—A comprehensive checklist to analyze those key factors that can determine the success of your business plan. Strategy Action Plan—A tested format that includes step-by-step guidelines to develop a personalized business plan. The lessons gleaned from military history and strategy can be indispensable in the everyday management of your people and resources. By tapping into the universal logic and historic lessons of strategy, you will fortify your ability to think like a master strategist and add greater precision to your decision-making—thereby allowing you to outthink, outmaneuver, and outperform your competition. Norton Paley has brought his world-class experience and unique approach to business strategy to some of the global community's most respected organizations. Having launched his career with publishers McGraw-Hili and John Wiley & Sons, Paley founded Alexander-Norton Inc, bringing successful business techniques to clients around the globe including the international training organization Strategic Management Group, where he served as senior consultant. Paley has lectured in The Republic of China and Mexico and has presented training seminars throughout the Pacific Rim and Europe for Dow Chemical and Cargill. As a seminar leader at the American Management Association, he conducted competitive strategy, marketing management, and strategic planning programs for over 20 years.